Austria figures prominently in a map produced by the IS that outlines the group's five-year plan for expanding its caliphate into Europe, and has emerged as a central hub for jihadists seeking to fight in Syria. "The spectrum of recruits for the conflict in Syria is ethnically diverse. 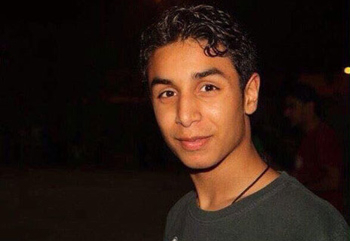 The motivation, however, appears to be uniformly jihadist." — Austrian intelligence agency BVT. "Allah also gives you the opportunity to wage jihad in Austria." — Austrian jihadist Firas Houidi. "We are proud that Allah has chosen us. We feel like lions." 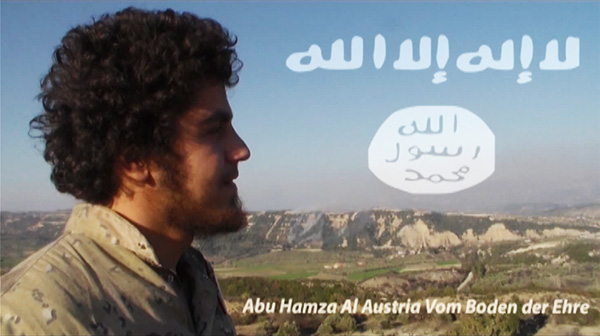 — Austrian jihadist Abu Hamza al-Austria. The Islamist known as "Abu Hamza al-Austria," fighting in Syria, pictured from his jihadist recruitment video. The short of it is, that groups that advocate the implementation of Sharia are advocating the overthrow of Western governments. This should be considered treason and conspiracy. These people should be deported, or tried for treason and executed. This is not a religious issue. How do we shape a strong strategy which is able to protect our European identity and our democratic system without going against those principles which makes Europe a democracy, in other words without becoming extremists ourselves? It strikes me that Austria might just work out to be a harder nut to crack than the Jihadis believe. Makes me yearn for the good old days, when all we had to worry about was the Commies trying to nuke us! Where's Khrushchev when we need him? I don't understand why those jihadists of European or American origin, who come back from the battlefields in Syria, Iraq and elsewhere to Europe and USA, why are they not arrested immediately at the border? why are they allowed to continue their activity? Is the fear the only instrument of fight?! Discard this failed and dangerous ideology of political correctness and multiculturalism. The war is going on today. European and American government must openly put all Muslims under surveillance, must proclaim the rules of the war...! Don' forget Hitler came from Austria. Austrians refused to pay any reparation to the victims of the Holocaust. My father who was murdered in the Holocaust, was an officer in the Austrian army in WWI, but Austria refused to pay us any damages. I found out that I have double citizenship when they asked me to vote in the Austrian elections. What nerve! They would sponsor a trip for me to visit this cursed land, you can keep it, Austrians. You can charm some people but not me. If the Salafi jihadis commit terror attacks in Europe the counter explosion of violence will be horrific. The "rich multicultural mix" was actually a toxic ill thought out explosive brew. It is not that peasants from backward countries cannot successfully immigrate to another country but the social expectations of that move need to be enforced. Salafis are moving to Europe to take over and put the nations under sharia law. Immigration for religious subjugation (subsidized by the state!) needs to come to an end. First rule: no going to war zones. Recruitment must be good since none of the current crop of semi-European jihadis appears to be doing much dying for their Allah and instead seem to be occupying their time cutting off heads from unresisting captives, women, and kids. I figure that the attraction will fade a bit when they are dancing around in their fashionable designer black frocks in front of armed folks that can really extract retribution for their barbaric behavior. Now is the time to read/re-read Ionesco's "The Rhinoceros". Self-proclaimed "peaceful Muslims", by definition, would call the Jihadists the true "infidels" indeed. But they cannot, or will not, since their terrorist brethren, well-armed and well-financed, pose an announced, direct threat to them should they dare utter such logic. This is probably reasonable to believe particularly in Brussels, Paris, London and, now Vienna. The diversity philosophies in these cities have been rendered asunder and the cup of welcome libation for a population allegedly thirsty for cultural refuge and safety has overflowed with the venom of their true intentions. Kindness did not beget kindness; it begat a tumor that has metastasized, fueled by economic generosities and salvation for which entire populations were duped. Due to the inefficient and open gateway, immigrants are streaming into Austria. It gets around how easy it is to get in and that money is just waiting to be taken from the soft hearted social system created by the Social Democrats. The so called public TV (ORF) aids the government policy of encouraging non Europeans to come to Austria. Here they have a license to do almost anything: recently 4 teenagers were found to mistreat animals in the local park, and even kill one of them: after much reporting, they failed to mention that these were not Austrians. And on it goes: the future looks bad for Austria. I hope Austrians (and all Europeans) read this article. I also hope they listen and take an action ASAP and not to be like an ostrich, hiding her head in sand when she sees or even feels danger. I am still of the opinion that Europeans (and Americans) should listen to the people who have been in the Middle East before anyone else AND have been dispersed everywhere more than anyone else....The Jewish people. The Barbarians are back and Europe is asleep, once again. Unfortunately, the Europeans (and the rest of the world) have not learned the lessons of the Second World War. In fact, they have been asleep since then. When the current Islamist Barbarians are through with the world, Nazism will look like a picnic. Where is WINSTON CHURCHILL when we need him? Hanna. Austria, birthplace of and eager embracer of Hitler and the Nazis. The gates of Vienna now flung wide open to the Islamist Nazism of Hitler's bestest buddy Haj Amin Al-Husseini, only this time it is turned against the non-Jews. Watchman, I think it is turned against Western (Judeo) Christian civilisation and, as I have written before, the Islamist forces are returning to avenge their defeat at the hands of Charles Martel (Tours, 732). They are intent on conquering Europe by stealth. To paraphrase Churchill "If we cannot stop this invasion the world will sink into a new Dark Age made more sinister and protracted by these cruel fundamental fanatics." The Austrians aren't renowned for their sense of irony, but we Brits, especially Jewish Brits are. So this is what you traded your Jews for. Enjoy !